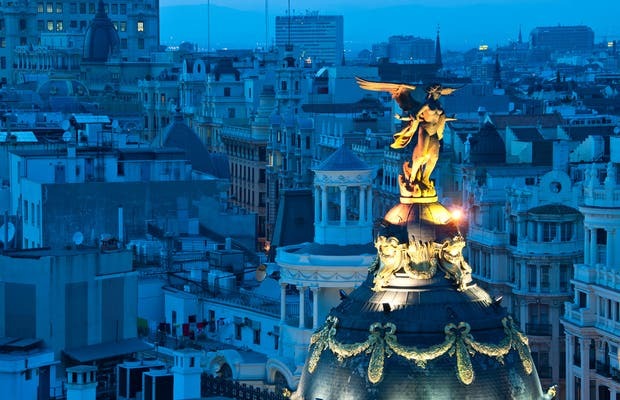 It has always been said that one of the most amazing places to enjoy dusk in Madrid is the Círculo de Bellas Artes. I had never been up there, and to be honest I wish I had gone before. Yes it is amazing. Going up there right at the time when the sun turns orange and goes down progressively until it disappears, giving way to what in photography is called "the magical hour", is a feeling all photography fans know you cannot put into words. It is a huge terrace roof where, even if there are many people, there is always a good spot to admire the horizon or take some unforgettable pictures. One of the best places to get a literal overview of Madrid if the roof terrace of the Círculo de Bellas Artes. It's especially wonderful if you go in the morning for breakfast when it's still cool and, if you brave the crowds, at sunset. It costs 3 euros to access the terrace and there are tables and lounge chairs as well as two bars serving breakfasts, lunches, drinks, and cocktails. Personally, I don't enjoy the evenings when they try to make it something of a Euro-trash hang out but I will admit that the atmosphere is nice at night during weekdays and in August when there aren't many people. Just don't go on a Friday night ;). The rest of the time, it's spectacular. You can see literally everything in Madrid excepts the Royal Palace: Gran Via, Cibeles, Atocha, the Four Towers, the scenic church steeples of Huertas and the Barrio Salamanca, the Paseo de la Castellana, the Prado Museum...everything! The terrace at the Círculo de Bellas Artes has been open for a while now and is where, for a 2€ entry fee (which gives access to all exhibits), we can enjoy one of the best views of Madrid, the Metrópolis Building, and the grandiose statue of Minerva that crowns the Círculo de Bellas Artes. Since there is not an inch of shade of the roof-deck, it quickly gets too hot during summer days. It’s best to visit during the evening when things cool down a bit. They also hold temporary exhibitions, such as that of the EFTI Photography School, that remain open throughout the summer. For those who are looking for a different perspective of Madrid, the Círculo de Bellas Arts (Fine Arts Association) has been offering its visitors an excellent alternative to admire the capital city: a bird eye's view. The 780 square meters terrace has incredible views from where you can appreciate the whole metropolis: Gran Vía, Recoletos, Puerta del Sol, Castellana, etc. One of the most impressive elements is the Metrópolis building. Even though anytime is good for the visit, one can say the last hour of light is ideal, especially if you want to take pictures since the sky takes spectacular colors. Probably one of the most beautiful terrace roofs in Madrid. Since recently it was a place restricted to the members of the Association (a club somewhat antiquated and manly where they would play pool and they had access to workshop rooms on the terrace roof, which are always empty). What happened? The people of the Association realized this restricted access was an elitist measure that would not allow the people of the city to know this spot. Now it is possible to visit the terrace roof sometimes paying 2€ or even for free on special occasion like the day of the Lectura del Quijote. I am lucky enough to have a less limited access thanks to my job and I can assure you this place is one of the spots in Madrid you cannot miss out on. Apart from this free access they organize parties and events (some of them are open to the public), when the terrace roof becomes an improvised runway, a crazy costume party or a romantic space for a poetry recital.